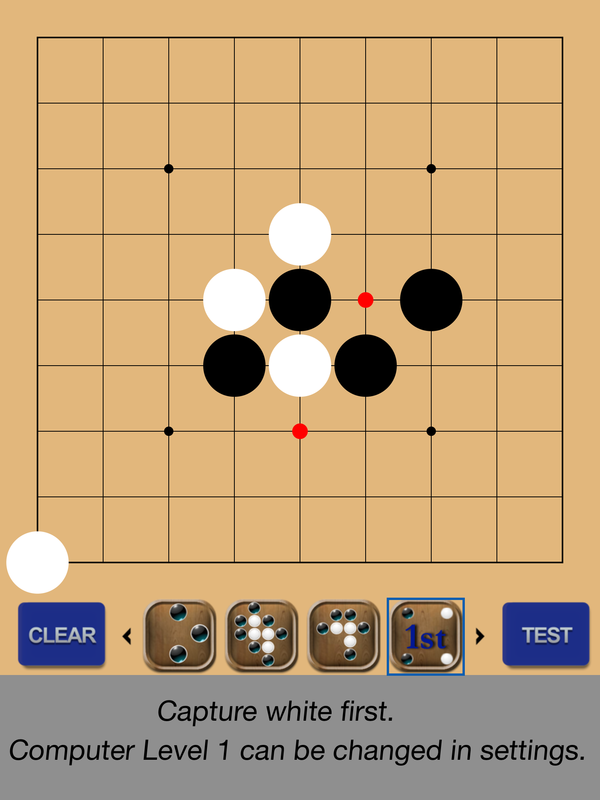 Do you know how to play Go and would like to teach your kids? Are you new to Go and want an enjoyable introduction? GoForKids teaches kids concepts about Go in a fun way. Master 12 different challenges before playing "First Capture Go" against the computer with 3 different levels. A 9 by 9 board is introduced that has a grid where stones can be placed at each intersection. 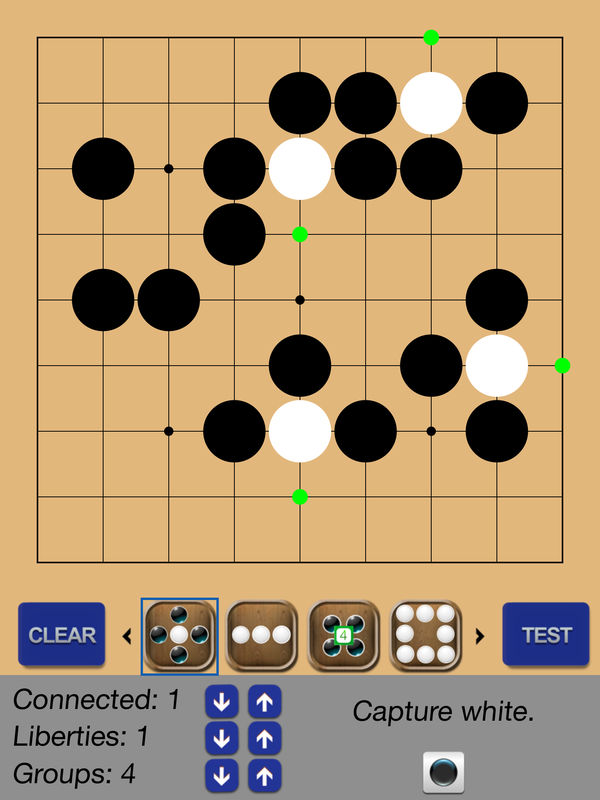 Moves alternate with black going first, then white. Select either the black stone button or white stone button in order to prevent the color of stone from alternating. This is helpful to set up game situations and illustrate concepts. Select a challenge icon to start a problem. Try to select the correct answer, and hints will be indicated by green dots to show the solution if needed. Click the TEST button and 4 challenges are randomly selected to be completed. 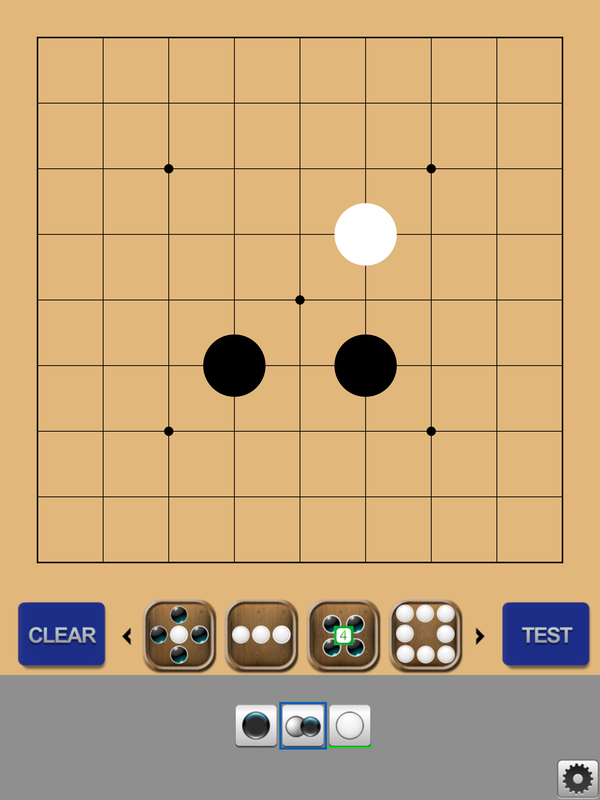 Go is a strategic board game made for two players where each player's objective is to gain the most territory. The first challenge is to learn how to capture a group of stones by surrounding them. The next challenge is to connect stones to form a group. Stones are connected when they are side by side. The group count challenge illustrates how stones are connected. In this game, you select the correct group that matches the number shown. The eye challenge demonstrates what an eye is and how to capture a group with one eye. The two eye challenge demonstrates the importance of two eyes in a group and how to identify them. The territory challenge shows how to identify which color has more territory. The one point jump challenge shows different situations where a one point jump can be useful to gain more territory. This challenge continues demonstrating different extensions and how they are useful. The knight jump challenge shows how the knight move pattern is used. The tiger mouth is an interesting move that is useful to secure a group. This challenge helps you to recognize the pattern. The ladder challenge shows the correct sequence of moves to capture your opponent in the ladder shape. The liberty challenge demonstrates how to count the liberties for each group. 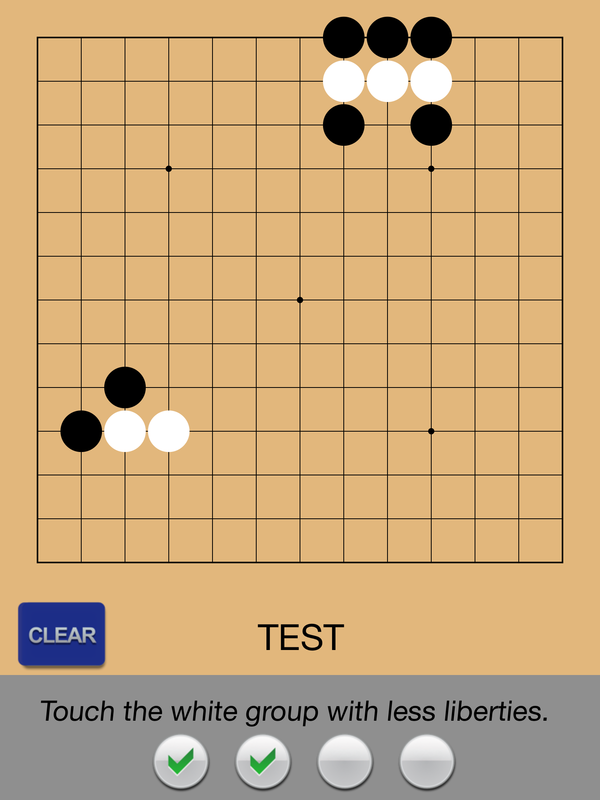 After learning concepts for playing Go, it's time to try a real game, playing against the computer in a simplified version of Go called "First Capture Go". There are 3 different simple levels to play against. Be the first to capture your opponent and you win! Thank you for using GoForKids, and please email us with any feedback. We want to continue to make improvements for the most enjoyable learning experience.